The chart below is something that I use to quickly plan and organize the segment of our practices. I believe in practicing situations at the end of every practice–even if for only five minutes. I have download links at the end of the post if you would like to download this document either in word or pdf format. This chart is a part of my 130 Situations eBook. Click this link to read a sample of the eBook. My objective is to make every situation that we practice as game-like as possible. Have assistant coaches (or managers if they are capable) officiate during your situation work. Have a manager—or a player who is out of the scrimmage–run the clock. Specify who is in the bonus or double bonus and how many timeouts each team has remaining. Who is in foul trouble? Who has the possession arrow? If a timeout is called in the situations have it like a game—set the timeout timer and have the players report to the bench. Have an assistant coach, coach the second team. The more game-like, you can make your practice segments, the better your preparation will be. On game night, the players will know that they have been through this before. Go through your practice timeouts just like the game. Draw the play on your whiteboard that you use during game timeouts. Remind each player of his spot and what his role is for the situation you are facing or the play you are running. Remind them of the foul situation, timeouts remaining, and who you are going to foul on the other team if that is appropriate. The home team refers to the first team or starters, the guest team refers to the second unit. Make 50 copies of these and attach one each night to your practice plan. 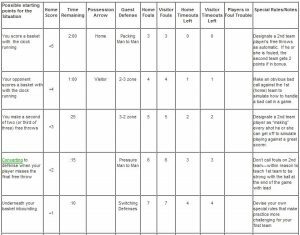 Circle one criteria from each column and you can quickly come up with an end of game situation to rehearse at the end of each night’s practice. The blank spaces are for you to insert your own ideas in any of the columns. Click here to: Download the chart as a word document. Click here to: Download the chart as a pdf. Feel free to email me if you have trouble downloading and I will email it to you in whichever format you specify. I have written a book for young basketball coaches and one of the chapters is on Special Situations. I would like to use your Special Situations Planning Chart in the book. However, my editor has told me that I must get written permission to put the chart in the book. So, I am requesting in writing permission to use the chart in the book. Please consider this email as an official request in writing to use the chart in my book. Thank you for any consideration in this matter.